Rebecca Deng, second from the right, and her team in Bor. Earlier this year PWRDF reported on the story of Rebecca Deng, a former lost girl of South Sudan now living in Winnipeg. With the help of fellow refugees at the Emmanuel Mission and St. Matthew’s Anglican in her adopted home, and the support of PWRDF’s Connections program, Deng returned to South Sudan last July to set up the Winnipeg Women’s Resource Centre in Bor. It wasn’t easy getting sewing machines and other supplies into the centre of the world’s newest country, buckling under civil war. Deng had to take drastic measures, making her way on foot across the city to get to the airport. Despite these initial challenges, the centre opened on September 5 and has been making a difference to women in Bor. Indeed, as parts of South Sudan are paralyzed by famine, the women’s centre shines as the hope for the future of the country. On paper, the centre has several strikes against it: a lack of electricity and communications equipment; not enough space to meet the needs of the 200 students; accessibility during the rainy season. Despite these infrastructure deficits, women and children are learning and thriving. In the life skills class, taught by Dr. Mary Gordon Ayom, women are learning about HIV and AIDS prevention, personal hygiene, water purification, livestock management and treating common diseases in domestic animals. Elderly circles happen weekly at the centre as well as at Lake Yak and Langbar. 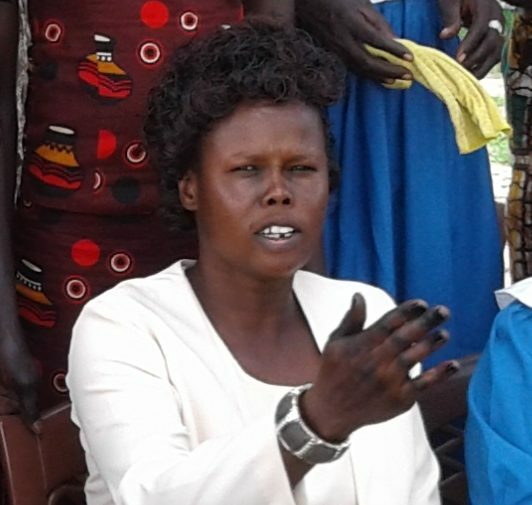 Leader Mary Nyanchol Anyiwei reports that the women have learned about female empowerment and the role of women in resolving conflict peacefully. The sessions have also dealt with the issue of alcohol consumption and how to treat alcohol addiction within their families. A hallmark to the program is the sewing class. Two dozen women learned every aspect of the craft, from assembling and disassembling the machines, drafting patterns, cutting fabric and making trousers, skirts, dresses and shirts. The literacy classes are also well attended. Children in the childcare class are reading, writing, recognizing words, singing and dancing. They are able to recite poems and tell stories, reports their teacher, Mary Yar Machar. However, the classroom needs a proper black board, more books and adequate lighting. With attendance projected to triple from September 2016 to February 2017, the classroom is also short on tables and chairs. Literacy teacher Den Kon Leek also recommends another teacher and an office to help manage the classroom more efficiently. The event also helped raise some much needed attention to the the ongoing war and famine in South Sudan, says Deng. CBC radio, CTV Winnipeg and the Winnipeg Free Press picked up the story and told of the dire situation in South Sudan.